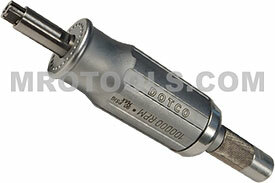 Dotco 10-90 Series Precision Turbine Grinders requires no air line lubrication. Dotco 10-90 Series Precision Turbine Grinders feature high precision ball bearings for long life expectancy and a two-stage turbine motor with a roll throttle. Dotco 10-90 Series Precision Turbine Grinders can achieve a superb finish with its high speed and precision spindle. Dotco 10-90 Series Precision Turbine Grinders are light weight and have a durable aluminum housing. Dotco 10-90 Series Precision Turbine Grinders feature low vibration and quiet operation that minimizes operator fatigue. The 10R9000-08 Dotco 10-90 Series Precision Turbine Grinder is one of thousands of quality tooling products available from MRO Tools. Please browse Dotco 10-90 Series Precision Turbine Grinders for tools similar to the 10R9000-08 Dotco 10-90 Series Precision Turbine Grinder. 10R9000-08 Dotco 10-90 Series Precision Turbine Grinder description summary: Dotco 10-90 Series Precision Turbine Grinder Collet Size: Free Speed (rpm): 100,000 Abrasive Capacity: 3/16'' Diamond Pin Type Housing: Aluminum Overall Length: 5.4''/137mm Air Inlet Size: 1/8'' Quantity discounts may be available for the 10R9000-08 Dotco 10-90 Series Precision Turbine Grinder. Please contact MRO Tools for details.